Over the past two decades, Parent-Child Interaction Therapy (PCIT) emerged as a leading-edge method for helping parents improve their children's disruptive and oppositional behavior. Today, PCIT has a robust evidence base; is used across the country in settings as diverse as hospitals, mental health centers, schools, and mobile clinics; and is rapidly gaining popularity in other parts of the world. In keeping with this increasing recognition of PCIT's effectiveness, the authors of Parent-Child Interaction Therapy present this expanded clinical edition to keep readers up to date on new practice developments, current treatment protocols, and the latest research findings. This update retains the fundamentals as detailed by PCIT's founder, Dr. Sheila Eyberg, including an overview of the therapy, detailed description of the course of treatment, and handout materials. The text goes further to explore the evolution of PCIT outside the original target ages of three-to-six (including preventive PCIT for very young children at risk) and examines the use of PCIT with special child populations, such as abuse victims and those with ADHD. Contributing experts discuss uses of the therapy in school, at home, with minorities, and with highly stressed families. But regardless of the population, setting, or topic covered, interventions remain faithful to basic PCIT principles and methods. Adaptations of PCIT for babies, toddlers, preteens, and siblings. Applications for abuse survivors, children with developmental disabilities, ADHD, and severe aggression problems. Uses of PCIT with separating or divorced parents. Culturally relevant PCIT for ethnic minority and international families. A brand-new chapter summarizing current research supporting PCIT. 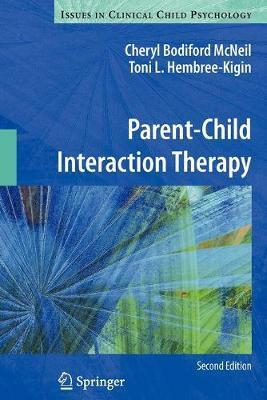 As PCIT broadens its scope, Parent-Child Interaction Therapy, Second Edition, brings innovative ideas and proven techniques to clinical child psychologists, school psychologists, and other mental health providers working to enhance the lives of children and their families. Illustrations note 8 Tables, black and white; XVIII, 484 p.
Adaptations of PCIT for babies, toddlers, preteens, and siblings.Applications for abuse survivors, children with developmental disabilities, ADHD, and severe aggression problems. Uses of PCIT with separating or divorced parents.Culturally relevant PCIT for ethnic minority and international families.Teacher-child, staff-child, and home-based applications.PCIT training guidelines.A brand-new chapter summarizing current research supporting PCIT.As PCIT broadens its scope, Parent-Child Interaction Therapy, Second Edition, brings innovative ideas and proven techniques to clinical child psychologists, school psychologists, and other mental health providers working to enhance the lives of children and their families. Fundamentals of Parent-Child Interaction Therapy.- Overview of Parent-Child Interaction Therapy.- Research on PCIT.- Intake Assessment and Therapy Orientation Session.- Teaching Child-Directed Interaction.- Coaching Child-Directed Interaction.- Teaching Parent-Directed Interaction.- Coaching Parent-Directed Interaction.- Progressing Through the Parent-Directed Interaction Sessions.- Adaptations of Parent-Child Interaction Therapy.- Younger Children.- Older Children.- Siblings.- Autism Spectrum Disorders.- Child Physical Abuse.- Anxiety Disorders.- Attention Deficit Hyperactivity Disorder.- Extremely Aggressive and Explosive Children.- Marital Conflict.- Parents with Major Life Stressors.- Ethnic Minority Children and Families.- Staff-Child Interaction Therapy.- Teacher-Child Interaction Therapy for Preschool Classrooms.- School Consultation.- Home-Based PCIT: From the Lab to the Living Room.- PCIT Around the World.- Training Issues.- Appendices. Cheryl Bodiford McNeil, Ph.D., is a Professor of Psychology in the Clinical Child Program at West Virginia University. She received her Ph.D. from the University of Florida. Dr. McNeil's clinical and research interests are focused on program development and evaluation, specifically with regard to abusive parenting practices and managing the disruptive behaviors of young children in both the home and school settings. She has authored two books (Parent-Child Interaction Therapy and Short-Term Play Therapy for Disruptive Children), a continuing education package (Working with Oppositional Defiant Disorder in Children), a psychotherapy DVD for the American Psychological Association (Parent-Child Interaction Therapy), and a classroom management program (The Tough Class Discipline Kit). In addition, Dr. McNeil has published numerous research articles and chapters related to the importance of intervening early with young children displaying disruptive behaviors. She is the wife of Dr. Daniel McNeil, a Professor of Psychology, and the mother of two school-aged boys. Toni Hembree-Kigin, Ph.D., is a licensed psychologist in independent practice in Mesa, Arizona. She received her Ph.D. from the University of Florida. Dr. Hembree-Kigin's clinical and research interests are focused on young children with disruptive behavior problems and those in shelter and foster care. She has authored three books (Mental Health Interventions with Preschool children, Parent-Child Interaction Therapy, and Short-Term Play Therapy for Disruptive Children) and a continuing education package (Working with Oppositional Defiant Disorder in Children). Dr. Hembree-Kigin designed the therapeutic milieu in the group home and shelter care for the Child Crisis Center East Valley based on the PCIT model. In addition, Dr. Hembree-Kigin has published numerous research articles and chapters related to the importance of intervening early with young children displaying disruptive behaviors. She is the wife of Dr. Timothy Kigin, school psychologist, and mother of three school-aged children.